I’m in Week 8 of a Working Out Loud Circle. This week is about building new habits. One of the ways suggested to build new habits is to chart your progress. Exercise 3 in this weeks Guide is to create your own progress chart. I’ve used progress charts to support habit-building in the past. With mixed results. Actually, there is a pattern to my results. I tend to struggle to embed new habits. I was reluctant to create another progress chart only to struggle to stick to the habits listed on it. However, I’d committed to do the exercises in the Circle Guides so pressed on. A whopping total of 44 habits to track (19 daily, 18 weekly and 7 monthly). My goal at the time was to complete 80% of these each month. It’s tempting to calculate the number of data points per month to track this, but I don’t think it’s necessary to make the point. Perhaps I should have added another one – to track my habits. Seriously … I see now how this was setting myself up for failure. This list is clearly unachievable and gave me a lot of reasons to beat myself up. However, there is a bigger problem with creating overwhelming lists of habits, routines and goals. When everything is a priority, nothing is a priority. I was not discerning enough about which of these habits would make the most difference in my life. In his book ‘The Power of Habit‘ Charles Duhigg allocates a whole chapter to ‘keystone habits.’ “The habits that matter most are the ones that, when they start to shift, dislodge and remake other patterns.” Duhigg characterises keystone habits as “small wins.” Based on research on small wins he notes that they “fuel transformative changes by leveraging tiny advantages into patterns that convince people that bigger achievements are within reach.” Duhigg also concludes that keystone habits encourage change “by creating structures that help other habits to flourish.” They create can atmosphere in which other behaviours emerge. I set up my Working Out Loud habit progress tracker. The complete list – just 4 daily habits – is shown below. My Daily Dispatch post (such as this post!) does take around 30 minutes a day, so is not really a ‘small’ win. However, if I pick my topics wisely each post can be used as part of the Reflection Challenge (#reflectchall) I’m doing this month at no additional effort. This leaves checking my Twitter relationship list for my current WOL Circle goal, and responding to two posts that others have made online. This could take as little as five minutes per day. Not overambitious (for a change). I’ll give this progress chart a go and report back at the end of month in a Dispatch. In late April 2018 Helen Blunden wrote a blog post ‘Create Your Own Personal learning Plan.’ She included a downloadable template. I wanted to try using her template, but was travelling at the time without ready access to a printer. I hand-drew up her template in a notebook and started using it (I love starting fresh notebooks so this action gave me a burst of enthusiasm). Each weekend I fill in the template in my notebook with the things that I feel are most important to accomplish in the coming week. Of course, this template is incomplete as a planning tool for it does not include any scheduling or capacity management. However, I’ve found it a useful part of my planning process. It helps me to make conscious choices about what aspects of my work and learning to progress each week. I supplement it with my calendar and to do list (for which I use the 2Do app). 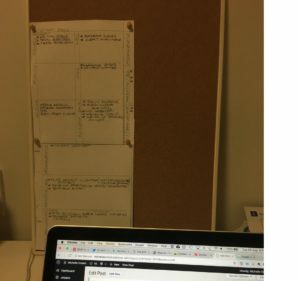 I’ve evolved the template over the four months I’ve been using it to cover both work and learning. It made sense to do this as the two are closely integrated for me (and many others, although not everyone recognises this). I am constantly learning through my work, and find it important to have a project to apply new knowledge and skills to as part of my learning process. In some instances that project is to create a piece of content (a blog, a video) that forces me to ‘sense-make’ and synthesise new knowledge with my experience and prior knowledge. I tend to get very consumed by my work. For balance I’ve included some categories specifically for personal, non-work activities. Now that I’ve stopped travelling and am settling into a new city I will probably add a category for a hobby or relaxation. I’ve had a couple of challenges using the template. The first is that I put more on my list each week than I can complete. At times I’ve simply extended the completion period to two weeks. I may try to reduce the template to a single A4 page to force me to reduce the number of activities listed each week. 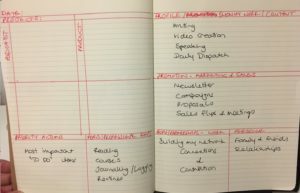 The second challenge is that having the weekly plan in a notebook reduces visibility. 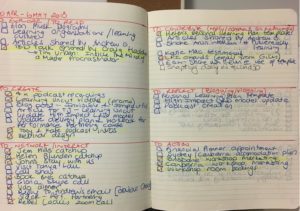 Often I did not look at the completed template until late in the week, when I would realise that I had missed opportunities to focus on the items I’d listed. In the past month I’ve started an informal ‘Mastermind’ check-in with a friend. This session helps hold me accountable for the key actions I’d committed to in the previous Mastermind session, and to clarify what is most important in the coming week. I now complete my template immediately after the Mastermind session, and am conscious of referring to it more frequently during the week as I feel a stronger sense of accountability to my Mastermind buddy. Today I copied this week’s completed template and pinned it on a noticeboard that sits on my newly set up desk. It’s definitely more visible, and I expect this will improve progress on the activities I list each week.